This red brick building in the Richardsonian Romanesque style bears a strong resemblance to Sever Hall, at Harvard University, designed by H.H. Richardson a dozen years earlier. The front and rear façades of this 2½-storey institutional building are highly symmetrical. It is hip-roofed with multiple hip-roofed dormers and tall brick chimneys. There is a centrally-located, large, pedimented gabled dormer on the front façade. Three-storey round towers with conical caps are situated on either side of the central façade. The Romanesque arch of the front entrance surrounds a complex doorway with sidelights and a transom. There are panels of decorative concrete, shell patterns on the towers and central bay, and a leafy pattern in the central gable. The upper floor of the central bay projects slightly over brick brackets, emphasizing the stone title block, “B.C. Protestant Orphans’ Home.” A marble plaque beside the door celebrates the donor J.G. Taylor. All the brick window casings have segmental arches and doublehung wooden sashes with horns. The roof is clad in slate. A number of additions have occurred in the last 120 years. The main brick extension at the rear is clad red brick with details matching the original; its steeply-hipped roof is shingled. The magnificent brick edifice that anchors this complex was built as an orphanage by a benevolent society established by Bishop Edward Cridge and his wife in 1873. Thomas Hooper won the design competition, which called for a three-storey< brick structure; the 100-bed orphanage was built in five months for $20,310. Several church congregations, concerned about destitute children in Victoria, supported the B.C. Protestant Orphans’ Home. 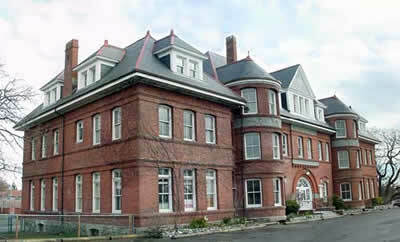 The first orphans were housed in a rented cottage downtown and then moved to a larger 2-storey building. In the 1890s, Irish-born John George Taylor willed $30,358 to the cause, enabling the society to buy land and erect a suitable building. Taylor was said to have made a modest fortune in both the California and Australia gold rushes, and later settled in Victoria, where he became a policeman. The society purchased 12 acres for $12,500 at the corner of Hillside and Cook Sts, and a foundation stone was laid on June 24 1893. The Grand Lodge of BC was represented at the event and the cornerstone was cemented with a Masonic ceremony to confirm the quality of the craftsmanship. A time capsule was placed within the cornerstone and this contained a copy of John George Taylor’s will, a BC directory for 1893, coins, and a list of the names of the architect and all contractors and workmen. The building contractors were McGregor and Jeeves, with John Kinsman as construction supervisor (father of Nellie Milne, 617 Battery St, James Bay, and Louisa Hall, 906 Linden Av, Fairfield). It was officially opened and dedicated by Bishop Cridge in 1893. The initial intake was 24 girls and 22 boys, most not actually orphans. Some came from broken families and others were placed there by their parents, who paid for their children’s keep, if they were able to do so. For some children the stay was only a short one, until their home conditions improved, but others grew up in the orphanage until aged 16 or 17. More than 1600 children lived at the home over its 75-year history, and alumni who attended a reunion in 1996 testified to the excellent care they received. One staff member, Mrs Ada Barner, herself an orphan from Manitoba, worked at the home for 37 years, becoming head matron in 1927, and is credited with changing the atmosphere from institutional orphanage to a real children’s home. Both the name and the role of the institution changed in 1969. Re-named The Cridge Centre for the Family, it developed wide-ranging services that included subsidized family housing, counselling, recreation programmes, and student residences. The original building became a day care centre and the few remaining children in the home were re-assigned to new group homes within the family housing on the same property. A $300,000 renovation was carried out, and the Cridge Centre received municipal heritage designation in 1987. In 2005, the daycare centre moved into a new facility on the property and the old building (now known as The Taylor Building) was converted to residential suites for seniors. This included a new brick wing on the east side. The complex re-opened in 2006 in its new role as the Cridge Village Seniors’ Centre.